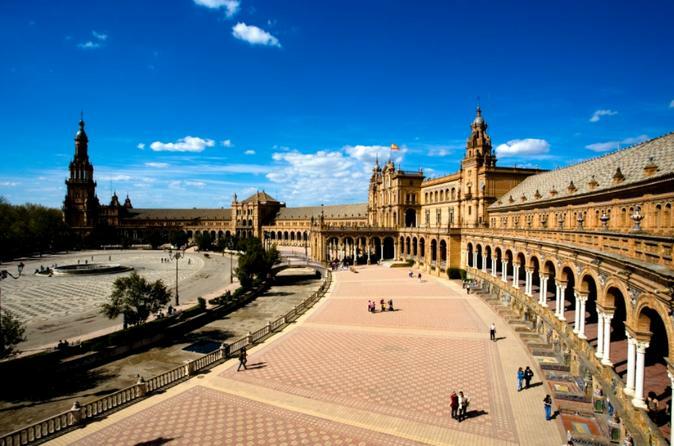 See the famous orange trees and beautiful architecture of Seville, Andalusia’s lovely capital city, on a full-day round-trip tour by train from Madrid. Board the AVE train at Madrid's Atocha Station and be met at Seville’s train station by your knowledgeable local guide. Then take a three-hour guided tour of Seville’s attractions, including the bullring, cathedral and Santa Cruz neighborhood, and have free time to explore the city on your own before returning to Madrid by train. With the company of our official tour guide of the city, visit emblematic works of historical and artistic heritage of Andalusia. You will be shocked by the Gothic-Mudejar beauty of the Reales Alcázares and amazed by the dimensions of the Cathedral of Saint Mary, both buildings declared as a World Heritage Site by UNESCO. Walk through the streets and the courtyards of the Barrio de Santa Cruz, the old Jewish quarter of Seville where it was established the second largest Jewish community in Spain, and if you feel up to it, finish the day with a climb of almost 98 meters at the Giralda, undisputed symbol of the city, a nice way to say goodbye to an unforgettable tour. When ending the tour, you will have free time. In the evening, you will return to the train station in Seville by yourself.